An article in INSEAD KNOWLEDGE recently caught my eye – read it HERE – and the associated SOURCE ARTICLE by Hafenbrack & Vohs (2018). …also at the end of their research paper. ⇒ Neurologically, by influencing the LIMBIC SYSTEM in various ways, and through increased consciousness by reducing brain-wave frequency to a level known as ALPHA, or THETA. Of course, it’s more complicated than that and there are overlaps but, together, these are known to result in improved stress tolerance, reduced anxiety, and a reduced tendency for depression. 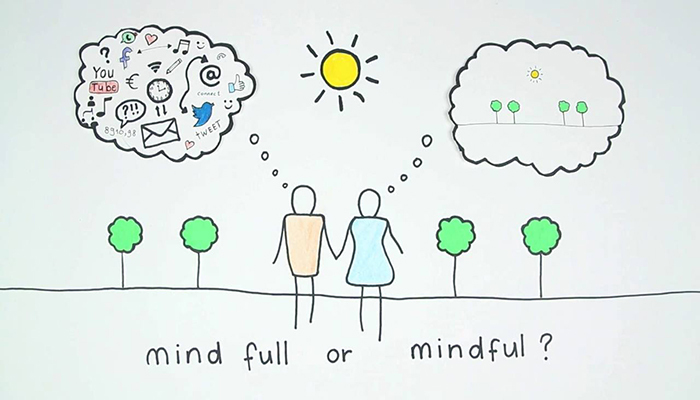 As these are beneficial to us all, mindfulness has become a popular self-maintenance/self-regulation practice that has also gained traction in organisation settings. What’s this article about then? In a nutshell, this study found that mindfulness meditation reduces motivation – which is not great news if you’re the kind of boss that wants a team of hard driving self-starters. HOWEVER, the interacting influence of other factors was found to balance out the motivation loss such that the reduction in motivation didn’t translate into diminished performance – which is much better news for the hard driving boss. Well, this study, along with a small number of others, found that it did. This is also supported directionally by our understanding of the neurological states impacted by mindfulness. For example, the following simple illustration of brain wave frequency cycles helps us to understand how and why this is the case. 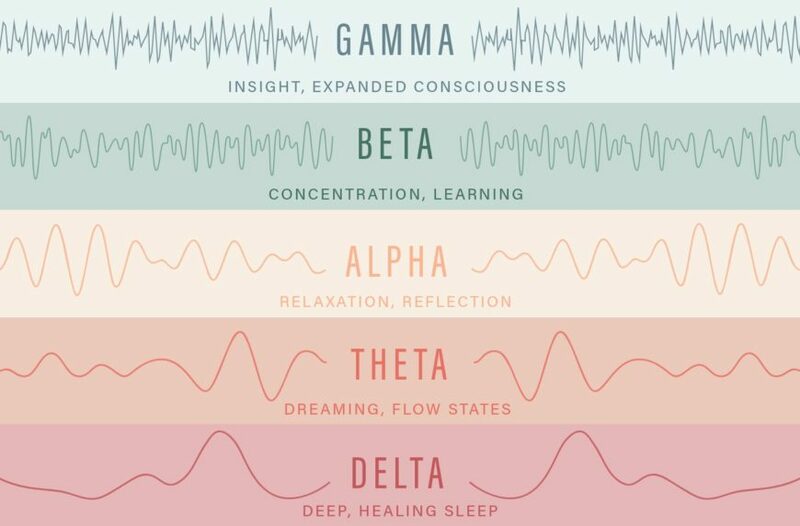 As we wake up from sleep, our brains are in a low frequency state, increasing from DELTA (0.5Hz to 4Hz), through THETA (4Hz to 7.5Hz) to ALPHA, where we are in a relaxed state of wakefulness (7.5Hz to 14Hz). These changes in brain wave frequency are matched by physiological changes. For example, stress hormones are released and our heart rate increases significantly as we cycle up through these frequencies. Take your pulse lying in bed as soon as you wake up (resting pulse). Then take it again later when you are at work. Even if you are sat down and inactive you’ll find that your heart rate will be significantly higher than it was previously. Depending on various factors, this awakening process can take a little time (e.g. we shuffle towards the coffee pot with one eye still shut), or it can happen almost instantaneously (e.g. we’re startled by a loud noise making us leap straight out of bed with our heart pounding). The arousal process continues as we perform increasingly demanding tasks (e.g. getting ready for work, organising the kids for school, or commencing work), and our brain frequency rises progressively through the BETA wave length (14Hz to 40Hz). Once we are fully alert, focussing intently on complicated tasks and processes requiring intensive concentration, like driving in bad weather or heavy traffic, our brains operate at what is currently the highest brain frequency measured, GAMMA (> 40Hz). This is a state of STRESS, and as stress increases, we are all prone to erratic behaviours and dramatic swings in mood and emotions. Road rage is an obvious example where normally placid individuals can turn into a fury-propelled monsters. Your car accelerator pedal is a good analogy for this neurological process. As you press the pedal you go faster and when you take your foot off the pedal, you slow down. Similarly, as you use increasingly more cognitive resources during intense periods of concentration, brain frequency increases and more ‘stress’ hormones are released (adrenaline, noradrenaline, cortisol, epinephrine, norepinephrine, etc). Conversely, as you relax, brain frequency reduces and stress hormones are replaced with ‘happy hormones’ (endorphin, dopamine, serotonin, oxytocin, GABA, etc). What does Gamma actually feel like? Obviously, we can’t actually feel anything happening in our brain, but the effects of these neurological processes are felt in other ways, physically and emotionally. For example, at very high stress/brain-wave frequencies you are likely to feel: highly alert, anxious, high-strung/tightly-wound/stressed. You’ll be wide-eyed, shallow breathing, and even holding your breath altogether. Your body posture and muscles will be tense. You’ll feel jumpy and skittish due to the fight or flight mode that comes with the release of adrenaline, noradrenaline, epinephrine, norepinephrine, etc. Your hands may tremble and your voice may be louder than usual, higher pitched, crackly or may break altogether. Your heart rate will be high, even if you’re fit and it’s normally low. You may get heart burn, or indigestion as your digestive system shuts down. Everything will irritate you. You will be quick to take offence and behave uncharacteristically aggressively. Afterwards, you’ll feel exhausted and emotionally drained. Do you recognise what Gamma feels like? Since Beta and Gamma brain frequencies are evident when we’re stressed, it’s intuitively obvious that mindfulness practices will positively impact stress levels by reversing the process described above. Reducing brain frequency to Alpha, or even Theta, is exactly what happens when we breathe properly and meditate. We relax, and when we are relaxed we are unlikely to be as alert, motivated, driven and active as we would be in the Beta and Gamma frequency range. While this study found that mindfulness meditation reduces motivation, and it makes intuitive sense that it would given what we know about brain-wave frequency cycles, in practice, nobody is going to meditate themselves into a semi-comatose, trance-like state while they are at work. Assuming no major crisis, they’ll simply do enough to de-stress and then carry on working as normal. This means they’ll moderate the short term motivation loss with relaxation techniques, but the longer term impact on motivation, trust, and working relationships is something else entirely since the circumstances associated with moments of extreme stress tend to be committed to memory, and translate into future behaviours. Does Mindfulness Reduced Motivation Really NOT Impact Performance? This is a trickier situation. While this study found that meditation induced motivation loss did not impact task performance, this finding is unlikely to be generalisable to many other situations. Much will depend upon the nature of the task and the environmental context, such as urgency/importance, dependencies with other important factors, relationships that are potentially impacted by performance loss, and the individual’s personality traits – such as the extent to which they are Conscientious, or Neurotic. For example, people that are highly Conscientious tend to be very task focussed, sometimes to the exclusion of everything else, so it’s reasonable to assume that these individuals would be less likely to suffer much of a performance loss. Conversely, people that are highly Neurotic personality tend to be hyper-sensitive to stress. As they are natural worriers, one would expect their performance to be strongly influenced by their motivational state and stress levels. Consequently, individuals with this personality trait are at an exceptionally high risk of negative health outcomes through work related stress. Without support, they don’t have the cognitive resources and natural coping mechanisms we commonly associate with stress resilience. Motivation is complex and individuals that are typically motivated tend also to be resilient. On the other hand, if workplace stress is so significant that it requires even these individuals to proactively meditate while at work, it’s inconceivable that performance won’t be negatively impacted. These are simply not the ideal conditions for achieving optimal performance. Similarly, less resilient individuals whose personality trait makeup means they are predisposed to worry, are more likely to withdraw from work entirely – so there is no performance at all. Given the REPORTS of increasing work related stress and the negative health outcomes associated with it, the emerging epidemics of ANXIETY and DEPRESSION, and the developing awareness of Mental Health generally, it’s unlikely that the current state of affairs will continue, i.e. where work practices negatively impact the mental and physical health of employees while the State welfare system picks up the health and social-care bill, and those affected, and their families, struggle on as best they can. We don’t recognise the seriousness of the problem because the health issues associated with work related stress occur in the future, not the present (except in the event of a sudden mental health crisis), so we don’t immediately recognise the need to do something about them. If you have an organisational leadership role, and you’re unsure about the impact of work related stress, or your responsibility, then consider the daunting statistics below and recognise the following likely scenario. As the world becomes more aware of Mental Health and the huge impact it has on the economy, on society, and on a very large number of individuals; it will be recognised that the challenges are so significant that there can never be sufficient support provided by the State welfare system. The need far exceeds the ability to meet it. Furthermore, even now, the cost to the public purse is so great that HM Government will ameliorate the budget risk by characterising work stress related mental ill-health as a type of industrial disease. Waiting to see what happens is an option, but it’s not a sensible one when we already know this is a serious problem. The increasing awareness of the extent of mental health issues is just the start of the process of figuring out the scale of the problem. We’ve yet to work out what needs to be done, but we do know that we all have a role and need to act. I quickly collated the following statistics at the time of the last World Mental Health Awareness day (10 Oct 2018). They are truly daunting, mainly because, as bad as they are, they only reflect the numbers of people that have sought help because they’re already ill and have had a formal diagnosis. The actual numbers of people struggling with mental health challenges that have not sought help, perhaps because of the associated stigma, is far larger, so these ‘mind-boggling’ reports are just the tip of the iceberg! How well are we managing Mental Health? Worldwide, 450 million people suffer from mental or behavioural disorders. More than 150 million people suffer from depression at any point in time. One in every fourfamilies has at least one family member with a mental disorder and where family members are often the primary carers – Department of Mental Health and Substance Dependence, Noncommunicable Diseases and Mental Health, World Health Organization (WHO). Presenteeism costs the UK economy £21.2 billion each year because: 1.8x as much productivity/working time is lost through presenteesim as through sickness absence. Presenteesim costs employers more because it’s most prevalent among higher paid staff, and it’s commonly associated with mental health issues due to people not feeling able to come forward, or take time off – Centre for Mental Health, 2017: Mental health at work: The business costs ten years on. More than 1m people world wide commit suicide every year – Department of Mental Health and Substance Dependence, Noncommunicable Diseases and Mental Health, World Health Organization (WHO). Suicide is the most common cause of death for men aged 20-49 years in England and Wales – Office for National Statistics, 2016: Deaths registered in England and Wales: 2015. The cost of replacing staff who leave their jobs due to mental ill-health each year is £3.1 billion. Improving the management of mental health in the workplace, including prevention and early identification of problems, could save employers at least £8 billiona year – Centre for Mental Health, 2017: Mental health at work: The business costs ten years on. Only one in six (17 per cent) organisations evaluate the impact of their health and wellbeing initiatives causing the CIPD to urge employers to ensure line managers were equipped to recognise early signs of stress and mental ill-health – CIPD Health and Wellbeing at Work Report, 2018. Only 30% of 18 to 29 year olds are comfortable talking with their manager about mental health issues – Business in the Community, 2017: Mental Health at Work Report. 60% of employees say they would feel more motivated and more likely to recommend their organisation as a good place to work if their employer took action to support mental health and wellbeing – Mind, 2013: How to promote wellbeing and tackle the causes of work-related mental health problems. 64% of Financial Services employees have experienced a mental health issue as a result of work. 30% have been formally diagnosed with a mental health issue; BUT only 16% of those working in financial services have taken mental health training courses – Business in the Community, 2017: Mental Health at Work Report . 93% of Junior Lawyers experienced stress in the past month. 73% think their firm can do more to support staff experiencing stress. Nearly 75% said their employer provides no help, support, or guidance around mental health in the workplace, or they are not aware of any support – The Law Society Junior Lawyers Division, 2017: Resilience and wellbeing report . 59% of Media employees have experienced mental ill health. 50% believe the Media industry is ‘not very accepting’ of those with mental health issues. More than 50%would be uncomfortable, or very uncomfortable, talking about mental health at work; and 30% of the Media employees surveyed describe their wellbeing in their job as ‘unhappy’ or ‘not at all happy’ – CIPR, 2016: State of PR Report. 25% of Emergency Services workers have thought about ending their lives. 92% have experienced stress, low mood and/or poor mental health in their role. 50% said they believed that they would be treated negatively if they disclosed a mental health issue to their organisation; and 86% believe more emotional support needs to be made available to emergency services workers – Mind, 2016: Blue Light poll. While Positive Psychology, Mindfulness and Wellbeing are all positive developments aimed at helping people cope with the stresses of daily life, they don’t replace the duty of care we all have to each other. Neither are they intended to be used as a tool to increase productivity. Even if it’s not widely known, the Science (neurology, psychology, genetics, biology, endocrinology) is well established. Long periods of intense stress are associated with very serious illnesses, life threatening diseases, and reduced life expectancy. For example, the field of EPIGENETICS has established links between environmental risk factors, such as periods of intense stress, and changes in our DNA – activating gene combinations leading to cellular mutations that trigger serious illnesses, like cancer? Epigenetisists refer to this as the NOCEBO effect (the opposite of PLACEBO). There is a myth that some people ‘cope’ well with stress. Whilst it’s true that steadily progressive exposure to stress helps to increase resilience; and the personality traits of some individuals means they have better emotional control than others (i.e. they don’t display stress in their behaviour as much as others might), EVERYBODY that regularly experiences intensely stressful situations also has increased risks of long term health impacts through the prolonged exposure to stress hormones. The more prolonged and intense that exposure, the higher the risk factors of associated with serious health consequences. Don’t make ‘constantly stressed’ a life-style choice. It’s not a good one if you want a long and healthy useful life. Why your workplace requires such resilience that you need extreme relaxation techniques and talking therapies just to avoid becoming one of the statistics listed above? It’s time to recognise that work related stress is a modern day problem. Because the potential health issues caused by stress tend to become apparent in the future, we need to learn to associate the cause with its effect, if only because we want to be healthy enough to enjoy our free time when our professional lives come to an end. We certainly don’t want to be dealing with the harmful side-effects associated with toxic levels of stress. ⇒ If you are an organisational leader. Do you understand the risks and sensitivities you are managing? Can you demonstrate how you are meeting your duty of care? Do you have access to professional advice? Is the leadership in your organisation adequately trained and behaving in accordance with your policies and culture? ⇒ If you are an employee. Do you understand the mental health risks you are exposed to? Can you demonstrate you are doing what you can to mitigate the risks, including making your boss aware of the difficulties? Stress tolerance is highly specific to each of us and we can’t expect other people to know how we are coping unless we tell them. ⇒ If you are a Lawyer or legal representative. Are you familiar with the complex psychological issues? Do you have robust and sensitive processes in place to represent your future clients? We can’t avoid stress in our daily lives and mindfulness is a great way to help take the edge off. It definitely does help but, in context of intense work related stress, it’s merely a sticking plaster. It doesn’t displace our duty of care to each other, and Mindfulness training isn’t enough on its own. We also need proper (informed) risk assessments supported by appropriate interventions. Protecting colleagues from the negative mental health impacts of work related stress is the right thing to do – remembering that workload and problem relationships are the biggest single contributors to work related stress. Managing work related stress will: reduce the risk factors associated with negative long term health outcomes; reduce the burden of health care on families and society more generally. It will protect YOU from potential prosecution and civil litigation. It will also protect your company’s assets in the future, when the Government gets around to re-allocating the financial responsibility. There are lots of simple things you can do to help yourself. Seeking help is not a sign of weakness. Mental and Physical health are so inter-related they are flip sides of the same coin. You wouldn’t think twice about seeing a GP if you’re ill so treat work related stress and/or mental health the same way. The consequences are just as serious, sometimes more so. If you like this article, please SHARE it with your followers and help spread the word. Being informed will make a difference.